Callum Morris joined Ross County in the summer. 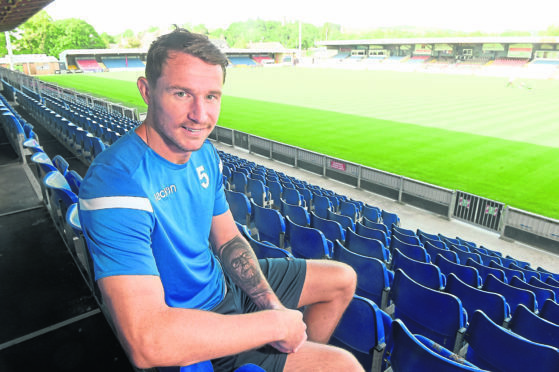 Ross County defender Callum Morris is confident the Staggies can quickly refocus for tomorrow’s definitive Betfred Cup tie against Alloa Athletic. The Staggies were left stunned by their 4-1 defeat by League 1 side Arbroath at Gayfield on Wednesday, in which the 10-man Staggies squandered the following Tony Dingwall’s red card. The result leaves County two points adrift of Group A leaders Alloa, who they face in their final group fixture at Recreation Park this weekend, meaning a victory will guarantee the Staggies progress to the second round, but anything less will see them fall short. The result was a major setback for co-managers Stuart Kettlewell and Steven Ferguson, who had started the group campaign impressively with victories over Elgin City and Dundee United, however former Aberdeen and Dundee United player Morris reckons the Dingwall side can put the shock result in Angus behind them. Morris said: “You want to get a bit of momentum going and build it up game-by-game. The Arbroath game was definitely a massive blip, but it’s something we can deal with and come back stronger from. “That is what we will do, it’s just about looking back over now, assessing it and making sure we do well come Saturday. County are preparing for the forthcoming Championship campaign, having been relegated from the top-flight last term, and face Alloa again in their first league fixture at Victoria Park next Saturday. Morris, who joined County on a two-year deal from Championship rivals Dunfermline earlier this summer, feels their heavy loss to the Red Lichties is a timely reminder they cannot expect an easy ride in the second-tier. The 28-year-old added: “It’s a tough one to take early on in the season, but maybe it’s a wake up call about how tough this season is going to be. “I think a lot of teams will probably play like Arbroath did, and we need to combat that. “It’s our job to be able to cope, to show our qualities and win games like that. We didn’t do that, which was disappointing.